Unique Gifts For Men and Unique Gifts For Women – Ideas For The Impossible To Buy For! I just love coming up with unique gifts for men and unique gifts for women. Some realy great ideas for those impossible to buy for people in our lives? The challenge of finding great and unique gifts for hard to buy for people is one I (sort of) look forward to every year. You know the person that has absolutely everything? Oh and let’s not forget those that insist they want nothing…nothing at all. Seriously, do they really mean that or are they just egging us on? Laying forth a challenge that simply must be met? Okay, before I sound a bit much like a medieval knight ready to do battle, let’s dive into the gift giving ideas! If you find yourself in a gift-giving conundrum, then you have come to the right place! I have put together some unique gifts for men and some unique gifts for women that are good for even the pickiest of gift recipients. Now, before we get to the list, here are a few tips when faced with a gift-giving roadblock. Coming up with perfect and fun unique gifts for men and unique gifts for women. Tip #1 Ask yourself what does this person like to do in their downtime? Hobbies are a great inspiration for gifts. If you can find out the hobbies of your picky recipients, then you are all set. But, what if they have a difficult hobby to buy for? Then try to think outside of the box. Give a book on the best rivers in the country, or a map with a case of push pins to keep track of all the rivers they have visited. By doing just a little research you might just be surprised at the gems you can find! Tip #2 What did they love as a child? I ADORE giving retro gifts. A memory from the past is always a winner. Not only does the recipient love it, but it inspires so many wonderful conversations as well. One year while talking to my Mother-in-Law she mentioned how she loved the card game called “Authors”. Imagine her surprise when she opened an original game from the 40’s that I happened to find on eBay. How about a calendar with grade school photos for each month. Oh yes, I just loved the beautiful 70’s hairstyle that I was styling in my 7th-grade school photo……said no one ever! Unique Gifts for Men and Unique Gifts for Women. Unique gift idea #1 – Stationary and stamps for special occasions. I gave this gift a few years ago to my Mother-in-Law and it was a big hit. She is not a computer person and just loves to write thank you letters and send notes to friends. To make it even more special, you can purchase different holiday-themed stamps. Celebrate stamps for Birthdays, love stamps for Valentine’s Day, wedding bell stamps for anniversaries and weddings, floral stamps for spring and Easter, flag stamps for summer and the 4th of July. 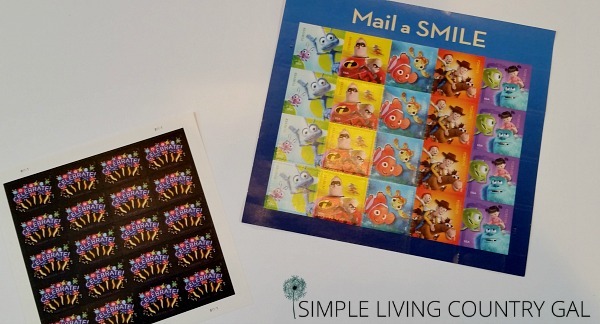 You can even coincide the stamps with the stationary and attach small notes for each packet. Tie with a ribbon and place in a pretty basket or gift box and you are all set! Not finding the best selection of stamps at your local post office? Usps.com has a wonderful selection and at $1.25 for shipping, (for domestic) it is a great deal as well! Unique gift idea #2 – Personalize a calendar (in a unique and fun new way). This next idea is at the top of my fun gifts list and is perfect for a picky family member. Say a brother maybe????? You can find lots of calendars online that you can customize with any photos of your own. Include a few captions and graphics to really spice it up and you are all set! 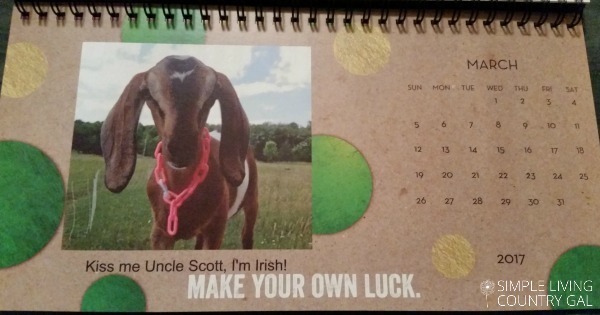 I made an “Ode to Uncle Scott” calendar from my goats. (he makes fun of his goat loving sister every chance he can get). Don’t have any goats?? Dig out those pictures from the past! The best ones are the awful hair day school pictures from junior high (haha) you know the ones with the velour shirts, hair for days and corduroy bell bottoms??? Oh wait, was that just me?? Anyhow, go crazy, include yourself and really have some fun with this unique gift. I promise it will at least get people talking! This is a really wonderful gift, but I must say it does take some planning. Several years ago for my Mother’s birthday, I borrowed my parent’s address book and sent a note to every friend and family member. In the note, I requested a card or letter be written for my mom but I asked them to send it to MY home address instead of hers. To make things easier I included an addressed and stamped envelope so there was no reason for them NOT to do it. While I waited for the letters, I purchased a beautiful photo album so I could put everything safely inside. As the cards and letters began arriving, I organized them inside the album. I then wrapped it up and gave it to my mom on her birthday. I cannot tell you how much she truly enjoyed that gift. Some people even sent photos from when they were children bringing back wonderful memories. It was so much fun watching her read all those loving notes and telling us stories of how she met everyone and tales from the past. Unique Gift Idea #4 – Icecream Sundae in a box! My friend just loves sundaes….but then again…who doesn’t? How fun was it for him to receive a hot fudge sundae gift box? You can purchase them pre-made like this one or you can save your money and make your own. The Dollar store had most of the supplies I needed at a steal. The basket, 4 sundae glasses, 4 long-handled spoons, assorted toppings, and a gift basket. I was able to put together a wonderful basket for less than $20. Unique Gift Idea #5 – Candy from our childhood. This gift is always a hit for any age. Remember the great penny candies from when we were kids? Well, they’re still out there! You can purchase retro candy gift boxes on Amazon and enjoy a trip down memory lane. You can also find some great candies from the past at Cracker Barrel. This is a great restaurant that has a wonderful gift shop with some amazing treasures hidden inside. I love to present this gift in a quirky candy jar or cookie jar to really make it fun. Unique Gift Idea #6 – A Memory Jar. We did this gift for my mother about 6 years ago. My 2 brothers, our spouses, all of our children and myself wrote memories and things we loved about my mom on tiny slips of paper. I made sure there were 365 in total one for each day of the year. Since we were all spread out, this gift needed to be done early to allow for mailing times. Each memory was then folded up and all put into a pretty mason jar tied with a bow. Every morning for a year my mother began her day with a loving sentiment from her children and grandchildren. I do believe she still has that jar on her shelf today all these years later. Sometimes the very best gifts are free. Unique Gift Idea #7 – Make a movie! This is my favorite gift by far! For my in-laws 30th Wedding Anniversary, we made a short video of their life together. My 4 boys each played a role. They acted out when my in-laws met, their wedding, and a few other key moments in their marriage. 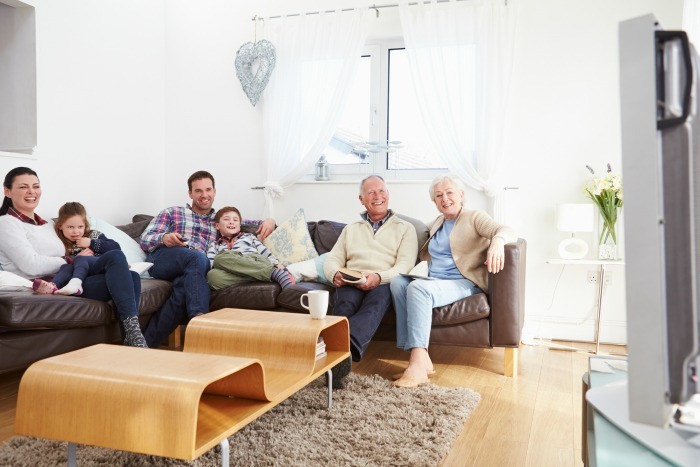 We had so much fun recreating their lives together that we still talk about it today! We wrapped up the gift and gave it to them over dinner at our home. We laughed and giggled as we all watched it. I will never forget the look on my Father-in-Law’s face seeing my son in a wig playing the role of his wife! It was silly, it was inexpensive to do and it touched my in-law’s hearts is such a magical way. They actually showed that movie to everyone that came to their home that year. It was a fun gift to create and a fun gift to give. I really hope these fun gifts inspire you to come up with some gift treasures for your hard to buy for family and friends. Do you have any ideas for unique gifts for men or unique gifts for women in your lives? Please share! 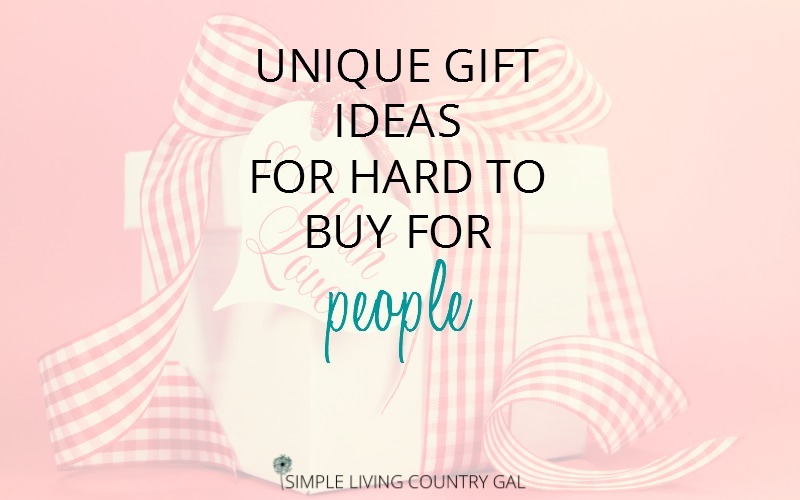 I would love to grow this list with even more great gifts! What a lot of great ideas! My daughter did the calendar idea for her Dad several years ago, with pictures from back in the day with her and him together. His birthday is Dec 22, so it’s always a challenge to come up with 2 gifts (birthday and Christmas) so close together. Love your blog. Thanks for stopping by. That would be difficult coming up with ideas, if you have any new ideas please share. 🙂 Happy Holidays! Great ideas! I will definitely be keeping this list handy. With 7 kids, 5 grandkids (so far) and significant others…it’s a huge challenge to be more interesting than a gift card.